I finally did it– for the first time in years I did a solo trip. I like to consider myself extremely social and enjoy being surrounded in good company, so traveling solo is completely new to me. I've always had the best of friends and two amazing sisters to join me in exploring different cities and countries around the world. I'm sure there are plenty of people out there who travel solo all the time, but for me it was a little nerve-wracking. A couple of weeks ago I had the opportunity to stay at The Rossi Hotel in Palm Springs on a weekend when my friends were all out of town. I couldn't pass up an incredible hotel room and figured it would be a great experience to try something new. A few hours into my trip to the desert I realized how great a trip by myself truly was. To make this 24 hour trip worthwhile, I turned to my California board on Pinterest and made my list of everything I wanted to see and do in Palm Springs. 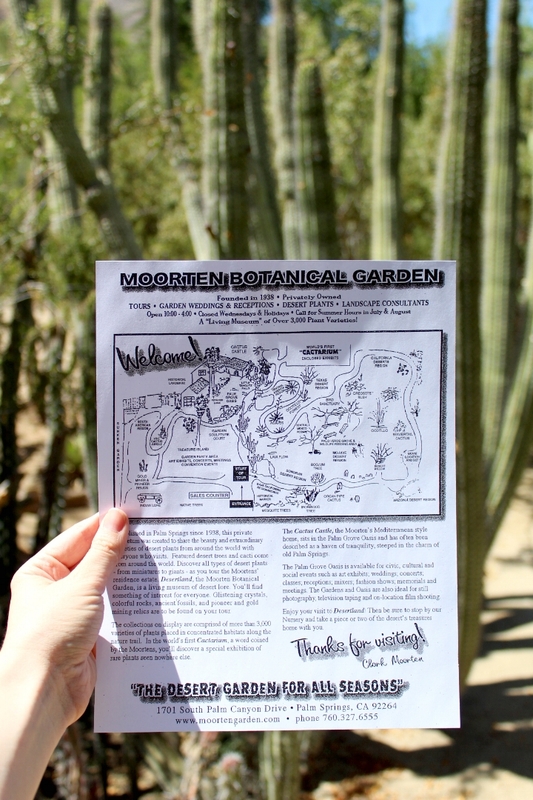 Arriving in the early afternoon I decided to make my way to the Moorten Botanical Gardens. I obviously saw tons of pictures of the greenhouse all over my Pinterest and Instagram feed, which inspired me to check it out. For $5 you can take a stroll among exotic succulent plant species. Everything was so pretty and I'm seriously shocked I didn't fall on a cactus when taking these pictures! The next thing I had to see was the infamous pink door. Did you know it's a historic landmark?! Expecting I'd have to do some digging on Google for the address I was pleasantly surprised to see that as it was listed as a landmark so you can find the address right away. Three minutes away from the botanical gardens and I was at the pink door snapping my pictures. Already having fun all by myself, I realized that solo traveling is perfect when you have a packed itinerary so you don't feel bored and wishing your friends weren't out of town to join you in the desert. My plan for a 24 hour trip was to complete a quintessential tour of Palm Springs. With only 24 hours, I had to make it count! Before I knew it, it was time to check into The Rossi Hotel. This hotel hosts a beautiful pool and private jacuzzis in each suite. I made my way to The Fountain Room and while I could tell this was the perfect escape for a romantic getaway, being alone and feeling like a princess with my bottle of Summer Water rosé and a bubbling jacuzzi was fine by me! The next morning was tough realizing I'd have to leave my beautiful oasis, but there was one thing left to do before saying goodbye to Palm Springs. This last item on my itinerary was brunch at King's Highway. This trendy diner breakfast was honestly perfect for a solo traveler. The restaurant has seats at a bar that face the kitchen, which is really great for people like me who don't always enjoy eating alone and want to bury themselves in both their phone and breakfast burrito. King's Highway can be found at The Ace Hotel Palm Springs, which is another one of my favorite hotels. A few years ago my sister and I had a 'sister trip' in Palm Springs and stayed at The Ace Hotel, which was also a very memorable weekend getaway. Remembering how good the food was inspired me to add King's Highway to my last stop when spending only 24 hours in Palm Springs. Hopefully, this post inspires someone to do a solo trip! My best advice is to make an agenda. Immediately, I thought, "oh no I don't have someone to share it with." However, for someone who loves to create content, it was great to travel and do something I love to do all by myself.